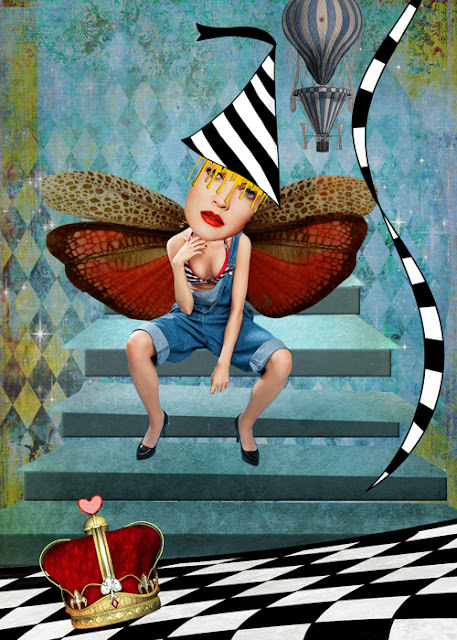 Hi, it's me Ann, and this week we have HATS AND CROWN AND WINGS AND THINGS as our theme at the Three Muses, and I'm sure you will be bursting with ideas for this one but just in case you need a little help, here is a sample to get you started. If you want to see why Mavis is looking perplexed then pop across to Taluula's for the answer. My entry is on my Ravenpainting blog- I always love this theme! Holala Ann, this is just perfect! In the intention, AND in the artwork! This was such fun! Ann, your sample is just wonderful. Here's my winged and crowned creation. Your sample is awesome, Ann. I just put my entry on blog here. I can't wait to see what the rest of you have done! Definitely a fun theme. Fabulous example!! Love love love! Looking forward to checking out all the entries! My name links to the post with the challenge! Please view my artpiece on my blog. Thank you. My little girl is on my blog. Lovely sample Ann! My entry is on my blog. I posted it early, so please scroll down a bit. Thanks for looking. Thanks for a great challenge, as always! Find my entry HERE. Great challenge!!! and I love the inspiration...awesome! My entry is also on my blog.. If you look closely you will find a crown, hat and wings! Off to see all the other imaginations at work!